Besides the medications we can prescribe, we offer the following products and treatments in our office to improve your acne beyond what you can do at home. And enhance your results and treat mild acne with at home products we carry at Beauty Bar MD, such as: SkinMedica Acne System and Neostrata skincare. A breakthrough in acne treatment, Isolaz can clear acne and keep it from returning. Clinical trials show results within 24-48 hours, including reduced redness, drying and smoothing of blemishes. Studies showed up to 88% clearance of acne lesions following 4-6 treatments. Isolaz loosens and extracts blackheads, dirt, and oils that can clog pores. It also destroys bacteria and stimulates sloughing of oils and dead skin cells. There is no down time and the treatment is painless, most often described as the sensation of a warm massage. No numbing is required. $200 – $300 per facial treatment when a series of 4 is purchased. The Villani Treatment is a revolutionary treatment unlike any other treatment currently available. Utilizing VSMTM, a compound derived from a rare variant of marine sponge, this treatment produces results rivaled only by Accutane, but without the downtime and potential side-effects. VSMTM improves acne by reducing oil production, accelerating sloughing of the external skin layer, reducing blocked pores, decreasing bacterial accounts and reducing inflammation. As low as $100 each when a package is purchased. For an appointment or more information, call Dr. Klein’s Euro Day Spa at (949) 495-4500. SmoothBeam Laser treatment can clear acne and keep it from returning with just four (4) monthly treatments! While this treatment is uncomfortable, it permanently shrinks sebaceous glands, curing in many cases. $200 – $350 per facial treatment when a series of 4 is purchased. This specialty facial is available at Dr. Klein’s spa, Euro Day Spa, and focuses on deep cleansing and extractions. A skin analysis, steaming, exfoliation, masque, and anti-oxidant treatment are also included with our 50 min. Acne Facials. Epicuren facials and Organic Customized facials are also excellent treatments for acne. For an appointment or more information, call Dr. Klein’s, Euro Day Spa at (949) 495-4500. This innovative cosmetic procedure utilizes sterile aluminum oxide crystals to gently and safely smooth skin irregularities such as acne scars and blemishes. It also helps to remove blackheads and whiteheads. No special preparation is needed and there is zero recovery time. Because microdermabrasion is gentle and gradual, a series of treatments is needed to achieve the desired results. Available in our office. 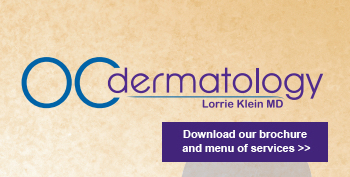 Lighter microdermabrasion is available at Dr. Klein,s Euro Day Spa. To learn more or schedule an appointment for a consultation or treatment, call OC Dermatology at 949-363-1788 or Euro Day Spa at 959-495-4500. Voluma Â®, a new facial filler.